Gloria Nansubuga at a chess practice session at the SOM Chess Academy in Makindye, Kampala. 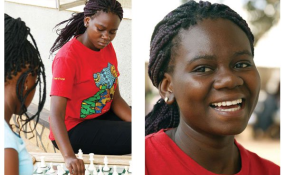 Gloria Nansubuga, 16, will forever be grateful for the opportunity to join the Sports Outreach Ministry (SOM) Chess Academy and Mentoring Centre in Kampala where she leant how to play the board game that has brought her international fame. Nansubuga became an international star when she won the Women Fédération Internationale des Échecs (Fide Master) title at the 43rd World Women's Chess Olympiad in October, 2018 in Batumi, Georgia. The Fide Master is the third highest rank in the World Chess Federation. The four levels are: Grandmaster, International Master, Fide Master (FM), and Candidate Master. Nansubuga's feat makes her the first Ugandan to achieve the Fide Master title and places her among the world's chess playing elite. "Chess has really changed my life because before joining SOM Chess Academy, I had dropped out of school after being abandoned by my parents. But now, I am going to Form 6 because of the shelter, food, health and education I have received while in this academy," Nansubuga told The EastAfrican. Nansubuga was born on November 12, 2001 to Lydia and Wilson Kasende, in Kampala's Katwe slum, made famous by Phiona Mutesi and whose life is immortalised by the film Queen of Katwe co-starring Oscar winner Lupita Nyong'o. Nansubuga also features in the film, playing a character teaching Mutesi's character the board game. The success story of SOM Academy is captured in the Disney production. "It was such an awesome thing. We could not believe that one day a film would be made about this academy. It is an inspiring story. The film is such a historic achievement that our grandchildren will also get to watch it," she says. "Through playing chess, I have travelled to South Africa, Greece, Georgia and Kenya. I have been to expensive places in Kampala like the Sheraton Kampala Hotel, Kampala Serena Hotel and Hotel Africana several times. For me it, it is a dream come true." Nansubuga is still awed by her own achievements and says of her world title win: "I played nine games. I won six and lost three to win the Fide Master title. I felt so happy because I never expected it. You know when you are playing chess and expecting to win, you normally lose. So I was on a probability and had to read a lot of chess books and consult my coaches about the different variations in chess. "Before going for the World Olympiad I had been beaten in Kisumu. I had lost hope but coach Robert Katende encouraged me not to quit and he had me train with different coaches from the SOM family, who helped me a lot," she adds. She is now planning "... to get the Grandmaster title. But right now because I am going to Form 6, I will just concentrate on my studies to fulfil my dream of becoming a doctor to save people's lives. Having grown up in a slum, I have seen people die because of lack of treatment," she says. Nansubuga attends the St Mbuga Vocational Secondary School in Makindye, Kampala, where she is studying biology, chemistry and food and nutrition. Nansubuga says she loves chess because it helps her concentrate and focus. She believes she did not choose to play chess but chess found her. When her father abandoned the family, Nansubuga and her siblings became destitute soon after. "My father separated from my mother when I was very young because he could not afford to look after us. Then when I was three years old, our mother left to find work in Juba, South Sudan, to fend for us. We haven't heard from her since she left. So, we don't know if she is alive or not. I still recall what she looks like. And we still have her pictures. My elder brother is currently studying in the US at Northwestern University. My younger brother lives with our maternal aunt," says Nansubuga matter of factly. The siblings ended up at SOM Academy, where they were enrolled into the chess family by the chess coach and founder of the academy, Robert Katende. Katende encouraged Nansubuga to try her hand at chess and encouraged to continue playing; eventually she mastered the game. "I communicate with our father. I know where he lives in Kampala. When I was in Form One, I visited him and he was very happy to hear about the changes SOM Academy is doing in our lives. He has other children in Kampala but they live with their mother because he cannot afford to provide for them either," she adds. At the age of 13, Nansubuga won the Best Female Honour at the Rwabushenyi Memorial Chess tournament and was Uganda's leading Uganda's U-14 and was sixth overall female chess player. On the African continent, among girls under 14, she ranked four out of 25 and 142 out of 2,649 female chess player. Worldwide, Nansubuga was ranked 6,205 out of 168,055 female chess players. The only other Ugandan female chess players that have attained the Woman Candidate Master ranking are Mutesi and Ivy Amoko.